It might be too early to write about the topic. But the temptation desists me from resisting any more. The king of fruits, it tastes like heaven. Yes. You know that. So I better get down to my stories. Back in the old days when I was a kid I used to visit 'Mianpur', my mother's village during the summer holidays. One of my childhood friend from the place was 'chabba' whose father owned a mango yard, I should say. 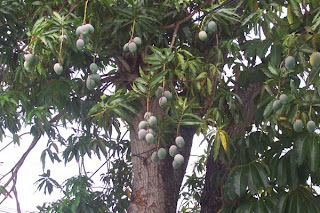 As the early summer rains come down the mangoes start to ripen. Somebody is needed in the yards to keep an eye. Even during the night. So somebody with a lot of spare time was sought after. Who better that we children? Mango trees are generally very huge. We used to tie two very long ropes at much height forming loops. On them loops was then a 'cot' rested. It used to make for a really large swing. Enough for 4-5 of us to lie down and sway around in a huge radius... The whole installation took around and hour, after we had arrived post lunch. A siesta then followed. Meanwhile continued our desert of the 'kacchi ambi'(green raw mangoes) with some rock salt. Too much of it and teeth ached, eyes reddened and the tangy taste send a shock down the spine, but why we still continued? ?...innocence of childhood, I guess. After the session it was time for a bath at the 'motor' (which was a tube well to a private well) churning water in packets into a cemented tub lined with algae and sand, but space big enough to accommodate all of us. A game was played seriously after the initial hoho-haha. All of us climbed up the roof of the motor-room adjacent the tank. 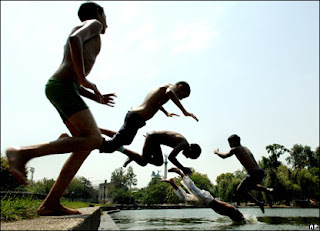 An 'ambi' was thrown into the water and as soon as it would touch the water, we jumped. We jumped a floor to reach for that 'ambi' & splash into the water!! ...have I mentioned we were all naked.